After a pilot phase last fall, battery-powered e-bikes are now a permanent fixture of the Capital Bikeshare fleet in Tysons. 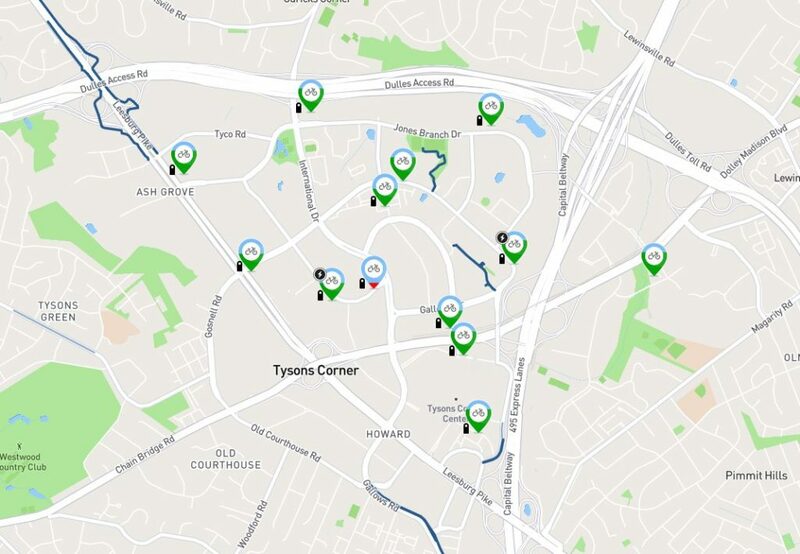 As of 12:30 p.m., there were two e-bikes in Tysons: one at Westpark and Jones Branch Drive, east of Tysons Galleria, and one at Greensboro and Pinnacle Drive east of the Galleria, near The Boro development. The e-bikes can be tracked on the Capital Bikeshare’s map, with lightning bolt icons showing the presence of an e-bike. The new bikes can go up to 18 mph and are designed to help with hills. The e-bikes are typically an additional $1 to ride, but the extra fare is being waived for all riders until April 15. Tysons is now up to 13 stations, with new stations added just north of Tysons Galleria and at the McLean Metro station in the last few months. 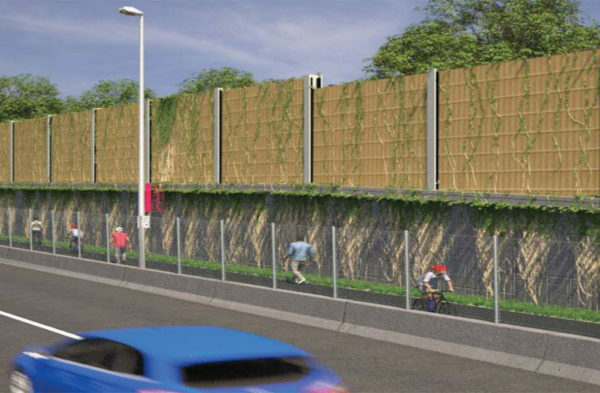 The Fairfax County Department of Transportation (FCDOT) is looking for some public input on new trail names for the bicycle and pedestrian path along I-66. No Traily McTrailface, please — FCDOT is seeking a more pleasant, non-gimmicky monicker for the trail, which is currently in planning but set for construction later this year. 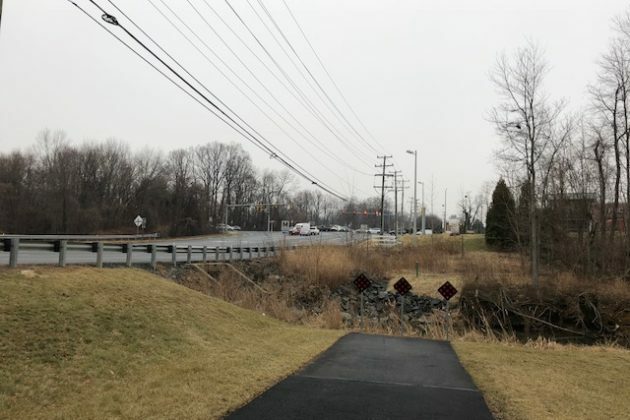 The trail — will run from Gallows Road in Vienna to Centreville — has more problems than just the name. 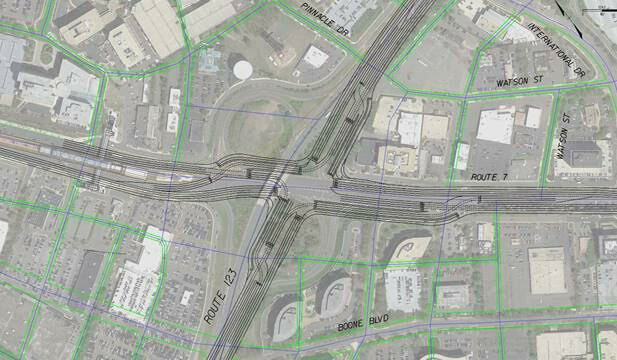 Discussion of the I-66 trail at that meeting turned contentious as bicycle advocates prodded Virginia Department of Transportation (VDOT) staff over issues like separation of the trail from the road and snow removal. For most of the length of the trail, the bicycle path will be at a separate elevation from the highway or running parallel on side streets. For a few miles, particularly near Vienna, however, the trail will be running directly alongside the highway. VDOT officials at the meeting noted that it was “not ideal for a pleasant bike-riding experience,” but placing the trail on the other side of the sound barrier would have cut into the back yards of homes along the road. Metro has an ongoing project to provide mobile phone and data service inside its train tunnels, but you wouldn’t know it in the tunnel between Tysons Corner Center Metro station and the Greensboro Metro station. Tysons Reporter tested cell service multiple times in the tunnel and every time, service was lost. For transit riders, it can be a frustrating coverage gap on the mostly above-ground Silver Line through Tysons. The call drops remain more than ten years after Metro signed a contract for cell carriers to wire tunnels to provide continuing coverage. A series of problems delayed the implementation of the plan, however. 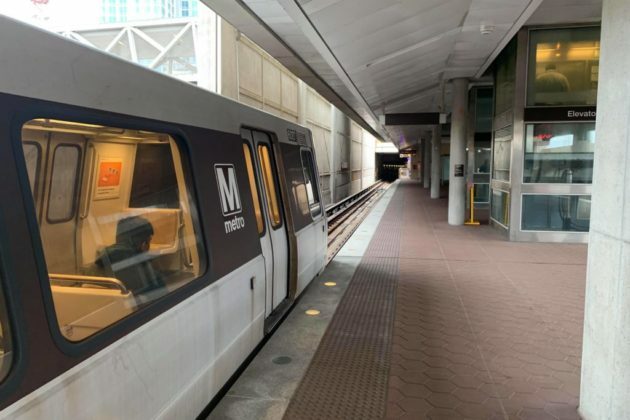 The tunnel frustrations haven’t been enough yet to deter local ridership; Tysons stations have had increasing ridership despite declines in other parts of the region. 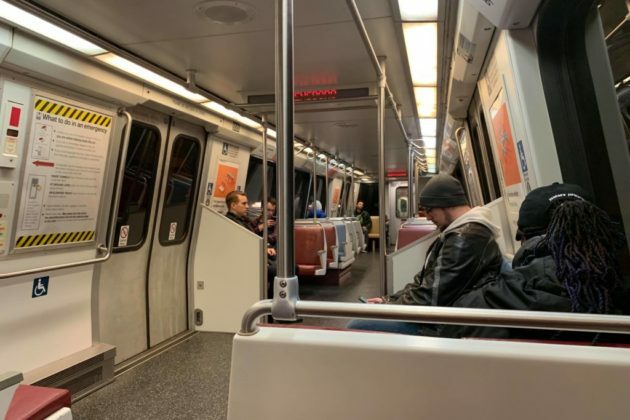 There is cell coverage elsewhere on the Silver Line, with connectivity available between the Potomac Avenue and Stadium Armory Metro stations, for instance. Additional cell coverage is planned for several stretches of tunnels on the Red, Green and Yellow lines, with the current goal being wireless coverage system-wide by 2021. But given the plan’s history of delays, riders might be better off just waiting until they’re on the other side of the tunnel to make that phone call. Dockless electronic scooters are coming to Fairfax County. Lime scooters will soon be released on the streets of Vienna, Merrifield and Falls Church, according to a press release. Users can use the Lime app to locate the nearest scooter, then scan the QR code on the handlebars or baseboard to use it. Users are encouraged to ride in bike lanes and wear helmets. Scooters cost $1 to unlock and 15 cents per minute to ride. Rides are finished in the app to be parked at a street curb or bike rack. Riders must be 18 years or older. E-scooters are popular in major cities D.C., and are already ubiquitous in close-in suburbs like Arlington, but the hoards of abandoned scooters left haphazardly strewn across the streets has also drawn some criticism or even dramatic acts of vandalism. 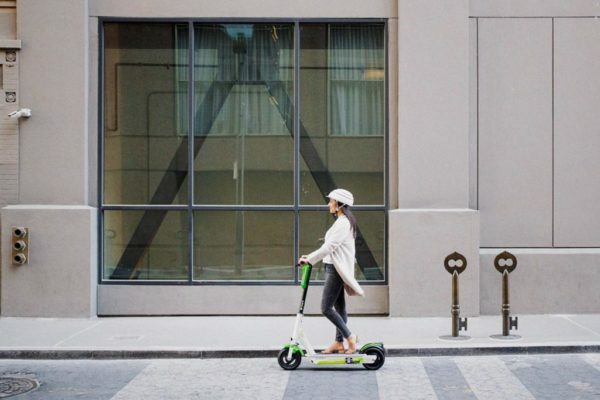 In addition to Vienna, Falls Church and Merrifield, Lime says it is also bringing scooters to George Mason University and the City of Fairfax. 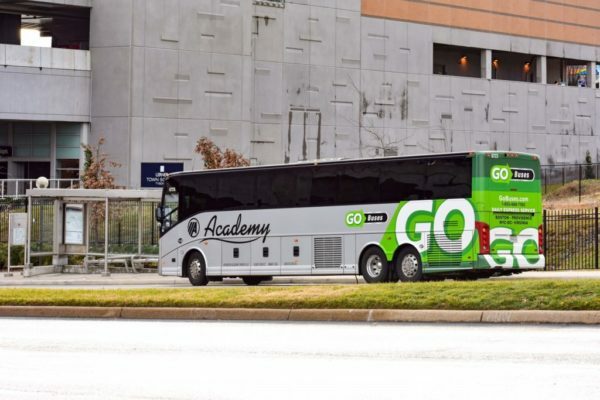 A new Fairfax Connector bus line is scheduled to start later this month, adding another set of connections from Tysons to Vienna and Dunn Loring. 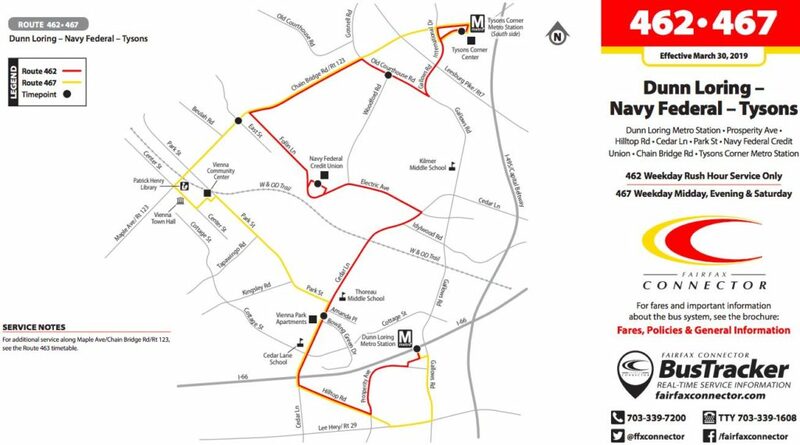 The new bus line bridges the north-south gap between the Tysons Corner Metro station on the Silver Line and the Dunn Loring Metro station on the Orange Line. 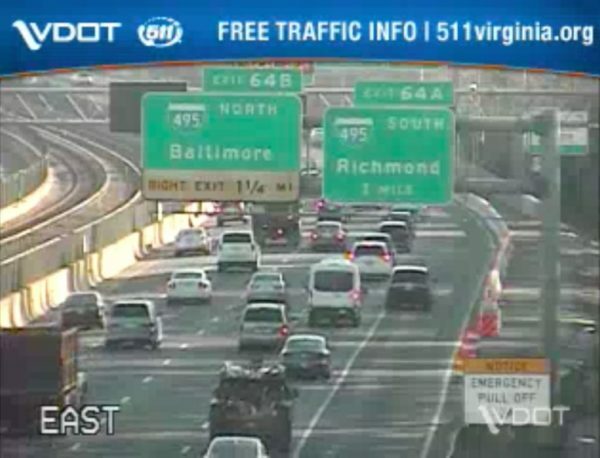 Route 467 starts and ends in the same spots as Route 462, but takes a more circuitous route through Vienna, turning at the corner, running from Dunn Loring to the corner of Center Street and Maple Avenue before turning to travel along the western side of Maple Avenue up to Tysons. Route 467 is scheduled to be active midday and evenings on weekdays and Saturday, starting Saturday, March 30. Arlington County saw an astounding decline of 20 percent in average weekday traffic in just 15 years from 2000 to 2015. That same period saw a growth of nearly 20 percent in population. Certainly, many of Arlington’s new residents drove cars — but not all, and some of its long-time residents must have found new ways to get around. There are several ways to fight congestion. Most people’s first thought is simply to widen the road. More road, more space for cars, less traffic — right? The problem is that it won’t work for long. For economists, mobility can be a commodity like any other. And when the government gives something away for free — in this case, it’s giving away the use of asphalt — of course people will clog the system. When something is available for free people will wait in line, paying with time instead of money. So, if highway engineers widen the roadway, it’s only a matter of years until more cars come along and the traffic is as bad as it ever was. 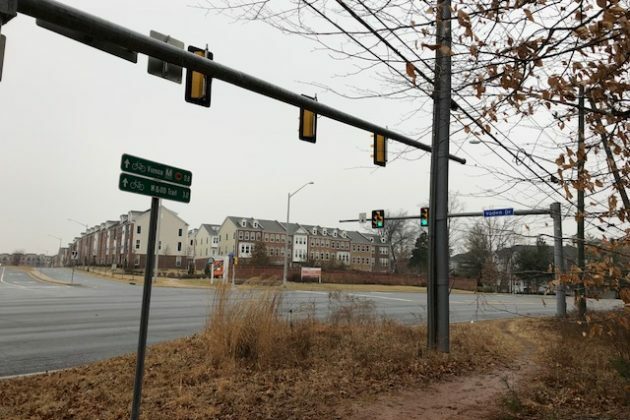 Another idea might be to slow down new development — but it would be difficult to persuade Fairfax County to forgo all the additional tax revenue. Third, the county could turn to public transit. The Metro arrived in Tysons in 2014 and, while ridership is increasing, it still lingers below expectations. It was certainly a step in the right direction, but Metrorail was a major investment, and it will take decades of development and improvements to local bus service and sidewalks before it sees full results. Transportation demand management is not a single technique, but a set of approaches that nudge people out of their cars and towards buses, bikes, walking and working remotely. It’s practiced cooperatively by Fairfax County, the Tysons Partnership and private developers. It often relies heavily on data-driven, highly connected approaches rather than on large infrastructure investments. One example of a transportation demand management program is the “Guaranteed Ride Home” offered by Fairfax County. This program offers commuters a free trip home up to four times every year. It’s intended for those who would consider a new kind of commute, but who the fear of unplanned overtime or family emergency keeps tethered to their cars. 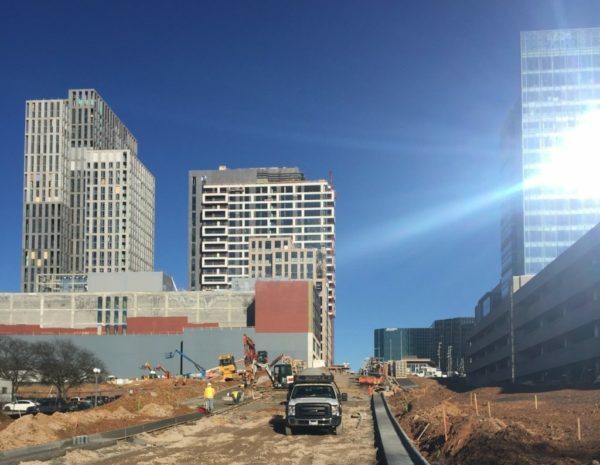 For a clearer understanding of what individual developers are doing to cut congestion, Tysons Reporter spoke with Caroline Flax of The Meridian Group, the master developer of The Boro. “We will have a pedestrian-only promenade that connects to Boro Park, and for the other streets we have created wide sidewalks with activated outdoor seating that will create a really inviting pedestrian experience,” she said. “[Transportation demand management] is about promoting the other transit options available to residents, visitors, and tenants — aside from driving,” she said. Those options include bicycles, buses, and trains. Caroline emphasized “making [The Boro] accessible in general” — including shared office/commercial parking to efficiently accommodate drivers, wide sidewalks for pedestrians, designated bike parking, Capital Bikeshare, and creating options for easy pick up and drop off by ride-hailing companies like Uber and Lyft. Flax said that she hopes visitors and tenants at The Boro embrace all modes of travel. 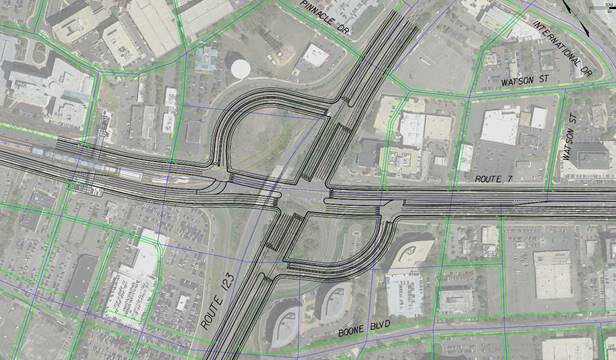 Flax also emphasized the new streets that will help make traffic smoother by creating more options and connections from the main thoroughfares in Tysons: Route 7, Westpark Drive and Greensboro Drive. Silver Hill Road, connecting from Greensboro Drive to Route 7, is expected to alleviate traffic on Westpark Drive. Another connection, called Broad Street, currently links drivers and pedestrians from Solutions Drive to another new street that connects to Route 7. Once the second phase of the project begins, Broad Street will connect Westpark Drive to Spring Hill Road. Smaller blocks make a neighborhood more walkable. Transportation demand management is a field still in its infancy, as planners and developers find new ways to work toward a more balanced transportation network. People across the country are searching for new tools, and Tysons, frequently dubbed “America’s Next Great City,” will have to work hard to be on the cutting edge. For years, the shared sidewalk on the south side of Lee Highway has ended abruptly with a ditch. 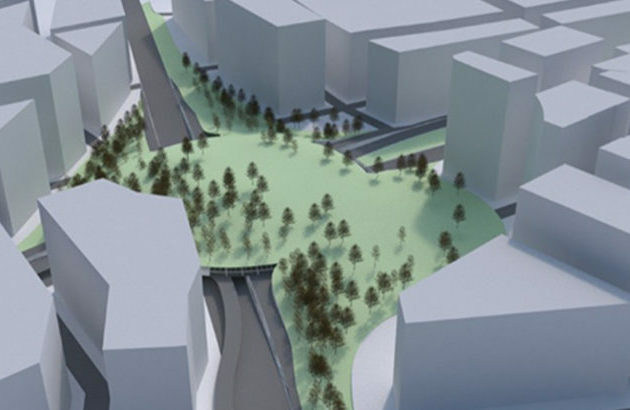 But a planned bike/pedestrian path on the highway just south of the Vienna Metro station could finally bridge that divide and make the sidewalks more walkable. 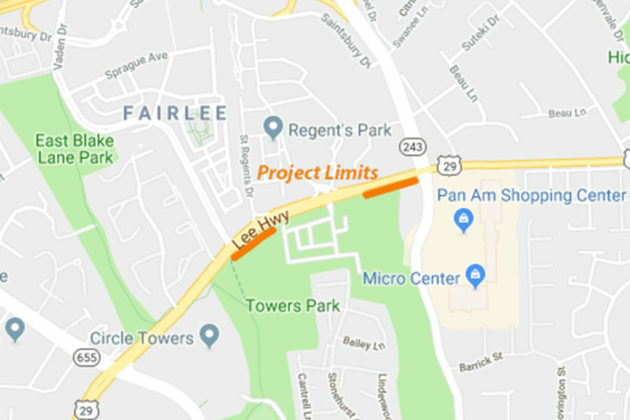 At a meeting tonight (Tuesday), Virginia Department of Transportation (VDOT) is scheduled to discuss plans to complete missing segments of a shared-use path on the southern side of Lee Highway between Vaden Drive and Nutley Street. The path aims to improve safety and accessibility for bicyclists and pedestrians near the Fairlee neighborhood. The $1.3 million project is being funded through the Transform I-66 Outside the Beltway project. Design approval for the project is scheduled for this fall, with construction beginning summer 2021. The meeting is scheduled for 6:30 at Fairhill Elementary School (3001 Chichester Lane) with a presentation starting at 7 p.m.
GO Bus, a bus line that operates throughout the northeast, has added an additional stop in Tysons. According to a press release, the new stop will be at the Tysons Corner Metro station. For the D.C. and Virginia service to/from New York City, this new stop joins five other stops in the D.C./Virginia metro area, and is the 13th stop overall in the GO Buses network. Other existing stops in the region include L’Enfant Plaza (C Street SW in D.C.), Eastern Market (Pennsylvania Avenue SE in D.C.), the Eisenhower Avenue Metro Station in Alexandria, the Fairfax/GMU Metro station in Vienna, and the Manassas commuter lot on Cushing Road in Manassas. The New York City stop is in Midtown Manhattan (30th Street between 9th and 10th Avenues). While the press release boasts fares as low as $18, the lowest Tysons to New York City tickets available over the next month are $22. This isn’t the first new affordable Tysons-New York line to open up. Last November, OurBus opened a new line to New York for around the same price.